For over nine years the open mic house on Agricola street has remained a gathering spot for musicians, travelers, activists and artists of Halifax . The house renters have expressed interest in having additional growing space for household and community use, perennial vegetables and guilds, and increased social and environmental infrastructure. I was interested in a demonstration landscape for my portfolio and the ability to grow out and propagate from uncommon specimens of perennial vegetables. The yard is 80′ by 48′, highly trafficked by guests, dogs and children. The site has a good proportion of full sun and is shaded on the edges by adjacent buildings and some elm and cedar trees. A south-facing wall runs the length of the yard, creating a sun-trap effect that is amplified by a second, low concrete wall 2.5 feet from the North wall. A fire pit provides a social focal point that compliments the deck and stage. Raised beds will provide protection from dogs, allow for growing and guilding away from polluted topsoil and will quickly add nutrients from sheet-mulching while the household begins to create compost on site. 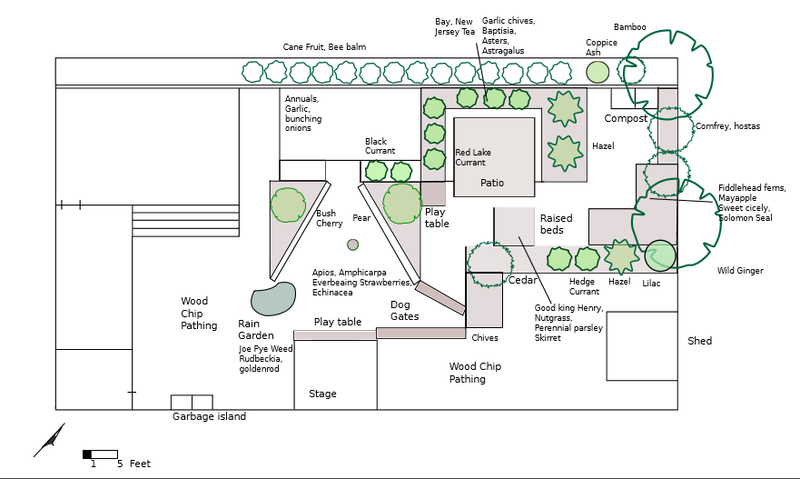 Bench space is added around the fire as are child-height tables for children’s use, and around a patio surrounded with raised beds. The budget for the project is shoestring and as many elements will be made from salvaged and found materials as possible.